Global Bank of Commerce, Ltd., licensed as an international financial institution in April 1983, is regulated by the Financial Services Regulatory Commission (FSRC) of Antigua and Barbuda, West Indies. The Bank is a member of the group of companies held by Executive Corporate Holdings Inc. (ECH), an Antigua formed corporation. The Bank’s Board of Directors, approved by the FSRC, is comprised of well recognized individuals with extensive experience in banking, wealth management and e-commerce sectors, and demonstrates the highest level of commitment to the Bank and its clients. Ian Layne is a former Barclays Bank Country Manager, with over 40 years banking experience, and has managed branches in Antigua and Barbuda and across the Eastern Caribbean region. On his retirement from Barclays, he held the positions of Bank Inspector and Audit/AML Compliance Inspector with another institution prior to exiting from executive positions in his banking career. Layne currently serves as a Director on the Bank's Board and is the Chair of its Credit Committee. He is a citizen of Antigua and Barbuda. Brian Stuart-Young brings more than 30 years of executive management experience to Global Bank of Commerce as Chairman of the Board. He was earlier a Fulbright Scholar and in his business career has served on a number of regional boards including the Caribbean Association of Banks (CAB); the Caribbean Association of Industry and Commerce (CAIC); the Caribbean Manufactures' Association (CMA); the Eastern Caribbean States Export Development Agency (ECSEDA); UWI Cave Hill Business School (EMBA certifications); Eastern Caribbean States Investment Promotion Services (ECIPS); Caribbean Union Bank, Ltd. He has been awarded "Caribbean Banker of the Year" in 2005 and 2006 and "Global Banker of the Year" 2007 by leading European business and financial publications. In 2010, he was recognised for his outstanding service and dedication to the Caribbean Association of Banks. He is also the Chairman of the Bank's holding company, Executive Corporate Holdings Inc., and its technology company affiliate - Global Processing Centre, Ltd. A citizen of Antigua and Barbuda, his experience in international banking, wealth management, Caribbean business, trade, ecommerce and communications continue to support the growth of the financial institution. Romell Tiwari has held senior accounting and financial administration positions for more than 20 years. He is a Fellow of the Chartered Association of Certified Accountants in the U.K. (FCCA) and holds a Masters in Business Administration (MBA) from the University of Wales. He has extensive audit experience having worked with the International Audit firms of KPMG, Peat Marwick and PricewaterhouseCoopers. 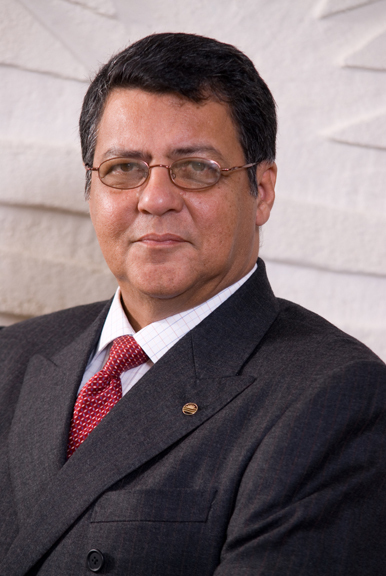 He has served as Chief Financial Officer with financial institutions in Antigua from 1991 through 1999. He was a consultant/internal auditor for the Food & Agriculture Organization (FAO) of the United Nations. He operates a service company that provides wealth management consultancy services, and the formation of international business companies and trusts. He is a citizen of Antigua and Barbuda and is a member of Antigua's Institute of Chartered Accountants. He currently serves as a Director on the Bank's board and is the Chair of the Bank's Audit Committee.